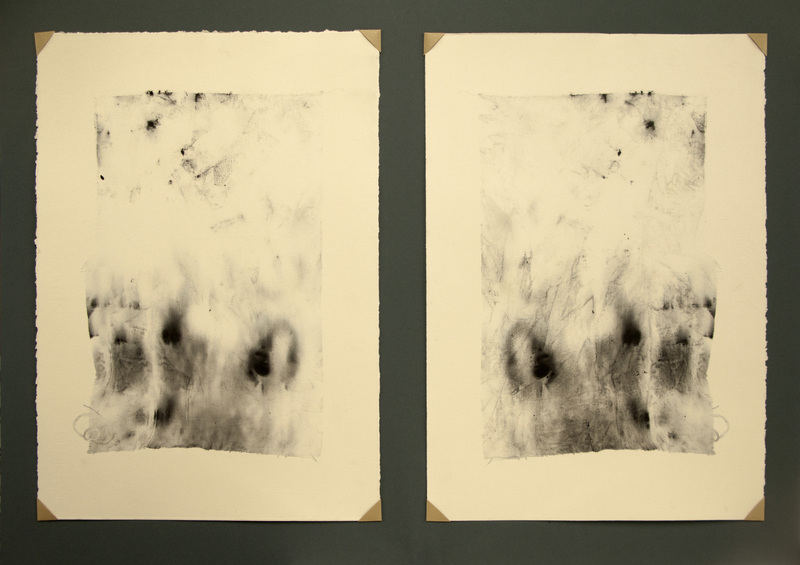 Fergal O’Mahony explored the printmaking process in his creation of Depth. With the use of his workshop cloth he approached print with a experimental eye. The cloth normally reserved to clean the surfaces of etching plates is reassessed as a method of print. Sandwiched between two sheets of printing paper O’Mahony printed the spirit and ink soaked rag to produce a double fibrous documentation. Fergal O’Mahony is a visual artist based in Dublin. Within his practice he aims to capture ephemeral actions in different materials. He has exhibited in Ireland, Wales and Estonia, the latter as a result of a printmaking residency at the Estonian Print Museum, Tartu, in 2014.